to commence his study of the next style on the list with the determination to note, in the first place, how far it resembled the preceding ones with which he is already familiar ; and he will endeavour to trace the progress of its growth out of them. He will then be met by the discovery that it did not resemble them in any essential particular, and that, as a matter of fact, it did not grow out of them at all. No, we are now face to face with a period marked by a great and revolutionary change; a period when Stuart forms, instead of furnishing inspiration for fresh ones on their own lines, had to contend against powerful rivalry, notwithstanding the fact that the dynasty under which they had come into existence had not yet succumbed to a stronger one—to one more acceptable to the country at large. The change that came about was not overwhelmingly sudden, but it was none the less sure. 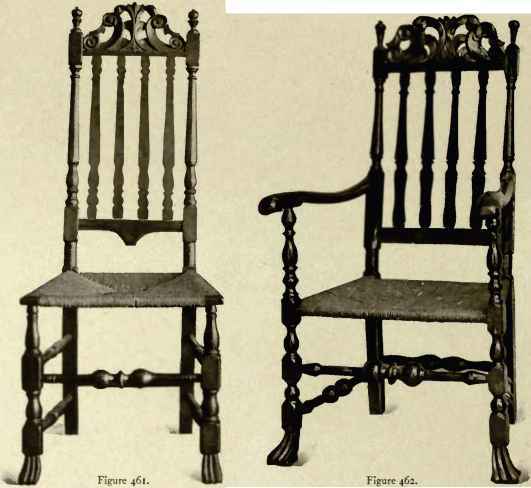 When we peep into the English homes of the last decade of the seventeenth century, we find that pieces of furniture, strange in form— strange at least at that time to this country—and entirely different from the sturdy old types that had "ruled the roost" for considerably over half a century, commence to put in an appearance here and there. Yet all endeavours to trace their origin in the older English styles prove to be absolutely fruitless. It is for us, then, to make ourselves acquainted with the causes underlying this change ; and to discover, if we can, the source whence these strange forms emanated. In doing so we shall see again most plainly that there is, after all. more than a little truth in the contention that the historv of a people may oftentimes be clearly read in their home surroundings.